A Portuguese laurel hedge covers the paling fence and merges the garden with the parkland beyond. The brief was to create a lush space that could be viewed from a raised patio and from inside the two-story house, and to change what was initially a rather cheap developer’s garden with some scrappy natives into an urban oasis. The garden also had to feel private when you walked through it the owners definitely didn’t want people in the neighbouring park seeing over the fence. and slate, interspersed in places with mondo grass. It was important that the new garden look as if it had been designed as part of the house, so I had to take the existing soft rendered finish on the walls and the sandstone-paved patio into consideration. Also, each owner liked different types of plants and planting styles, one being more formal than the other, so I needed to combine both preferences within the space. 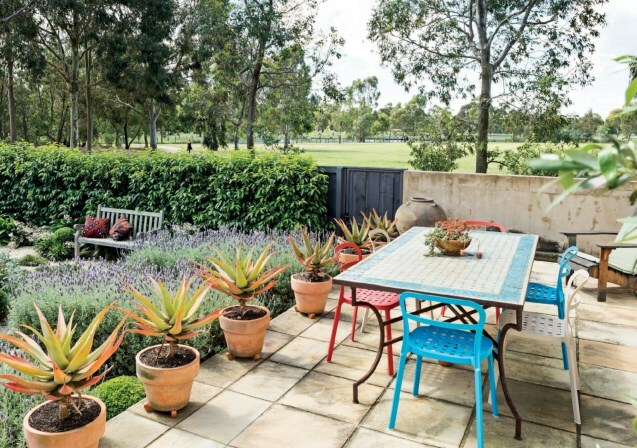 Although you can see the native gums in the park, the overall garden has a casual Mediterranean look with semi-formal features, such as hedging, were used to create garden spaces but inside each of those spaces, the look is loose and slightly overgrown, making them soft and inviting. An S-shaped curve, defined by mild steel edging, runs down one side of the garden to disguise the triangular shape of the block. It also means the garden is not seen all at once when you enter through the side gate, which works to make the overall space, which is quite compact, appear larger than it actually is. 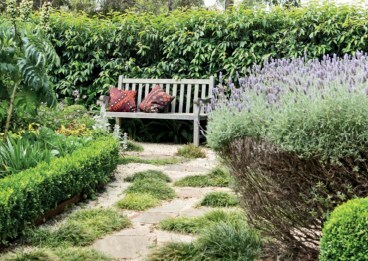 This “S” bed is quite deep, allowing for layered planting to disguise the fence boundaries, and is bordered by a low buxus hedge. towards the rear of the garden to add interest. On the other side, a Portuguese laurel hedge works as a nice backdrop, covering a plain paling fence and blending the garden into the park on the other side. 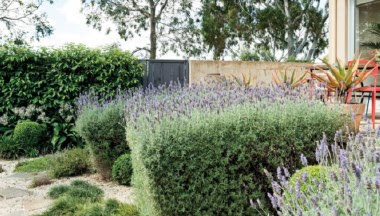 Along the base of the patio, there is a series of clipped French lavender fins, which echo the privacy screens attached to the house and create a strong graphic element in contrast to the softer elements. Between the lavender fins are tightly clipped buxus balls, which appear to have just rolled off the patio and found a place on the ground at random. the shape of the privacy screens on the residence. 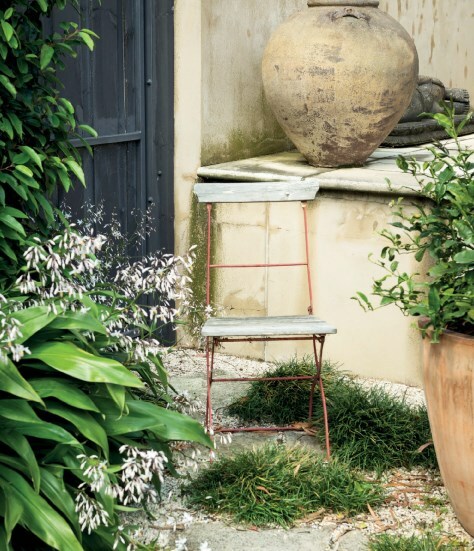 Other plants in the space include a kalamata olive tree, a lemon tree, mondo grass tuff s through the gravel and a Melianthus major, which attracts birds when in flower, and interesting serrated leaves thereafter. Contributing burgundy-red accents in the largely green planting palette, there is a Cercis canadensis ‘Forest Pansy’, redstemmed euphorbia and a coral bark maple. 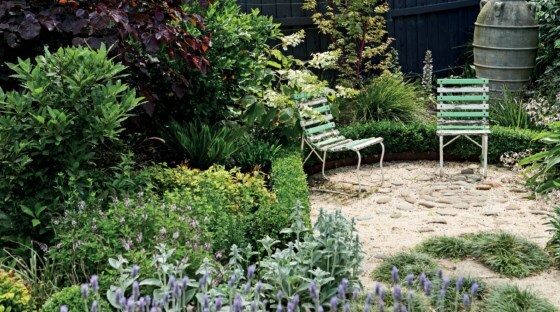 a leisurely view of the densely planted landscape. My approach is to design gardens that can be “gardened” and clipped if the owner chooses and has the time to create the semi-formal effect or they can be left for a year and become slightly overgrown and much softer while still looking good. This way the owner has choices and the garden doesn’t always need to look the same. 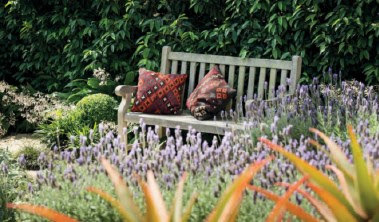 At the end of the day, I always ask myself, would I feel comfortable sitting in this garden having a drink or reading a book. If the answer is yes and I wouldn’t feel like I’m sitting in a display garden or a fancy hotel courtyard, then I have achieved what I set out to do.